The climate on the Roseland is a bit of a law unto itself and this has greatly influenced the gardening which, in many cases has a sub-tropical feel. 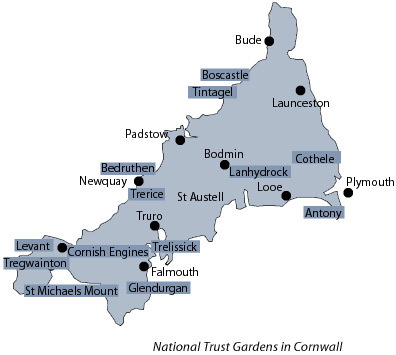 Apart from the well known National Trust gardens indicated on the map below, (which we do recommend) please don’t leave without visiting some of the other Great Gardens of Cornwall that are local to us. Like many of the Cornish gardens they are best visited in the Spring and early Summer and due to this many of them only open for a few months a year. Caerhays Gardens a stunning garden surrounding Caerhays Castle, which can also be viewed, is not one to miss. With their champion magnolias and breath taking camellias, azaleas and rhododendrons to name a few, a guided tour of the garden is definitely recommended, open between March and June. Trewithen Gardens another spring garden with 30 acres of woodland gardens surrounding Trewithen House, this too has champion magnolias as well as many spectacular trees. They are also home to a few red squirrels. Open from March to June. Lost Gardens of Heligan open all year this is a perfect place to go with all the family. 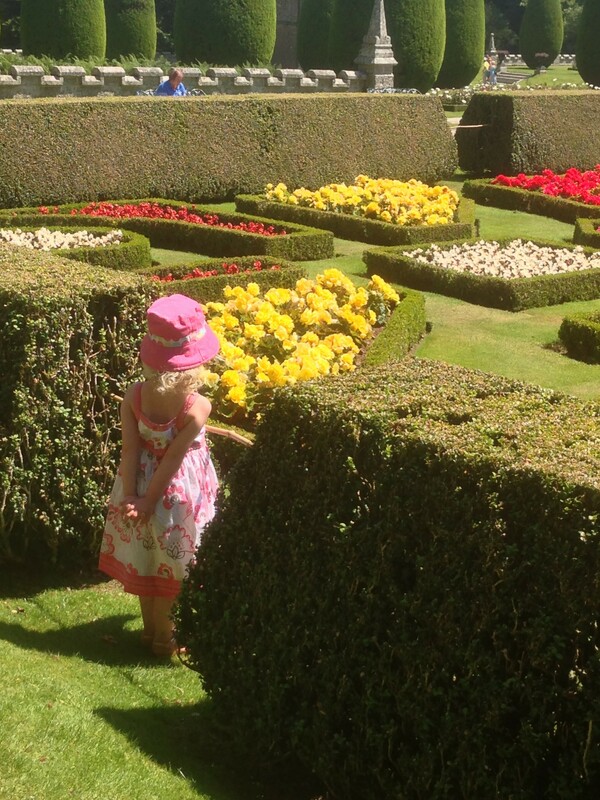 Beautiful gardens, woodland walks, adventure areas for the children and animals to see. Enjoy a delicious meal in the café made from home grown products or an ice cream out on the lawn. Poppy Cottage Garden, on the road towards St Mawes, this little garden is an inspiration, created in Dave and Tina’s back garden behind their dolls-house of a cottage. To top it off they serve their own homemade cakes in their tiny tea shop. Lamorran Gardens tucked into the hill in St Mawes. Open between April and September. Glendurgan Garden, NT near Falmouth set in an exotic valley running down to Durgan Beach. The banks are covered with primroses in the spring. St Michael’s Mount, NT located near Penzance, it is a must see on a clear day, with a pleasant walk or short boat trip across the bay it is fun for all the family. It is quite a steep climb up to the house, comfy footwear is recommended but well worth the visit. Trebah Garden, located next door to Glendurgan Gardens. It is open all year with every season bringing something new. It too has it own beach at the bottom of this exotic valley garden. Trelissick Garden, NT located in Feock on the other side of the estuary to the Roseland, why not take the King Harry Ferry to add a bit of fun to your adventure! Beautiful garden and stunning views, you can also have a look through some of the house. Lanhydrock, NT located near Bodmin, this is another great day out with all the family. With extensive park land with cycle routes and stunning box garden, (pictured above) in front of the house perfect while enjoying a picnic in the sun. The house is well worth visiting too with so many of the original bits to see. Eden Project on the other side of St Austell. With a large amount of this being inside it is a good one to visit on a rainy day. The biomes are really established now and fascinating to see. They have concerts held her in the warmer months and ice skating in the winter, there is also a bungee jump and zip wire for those of you feeling daring! 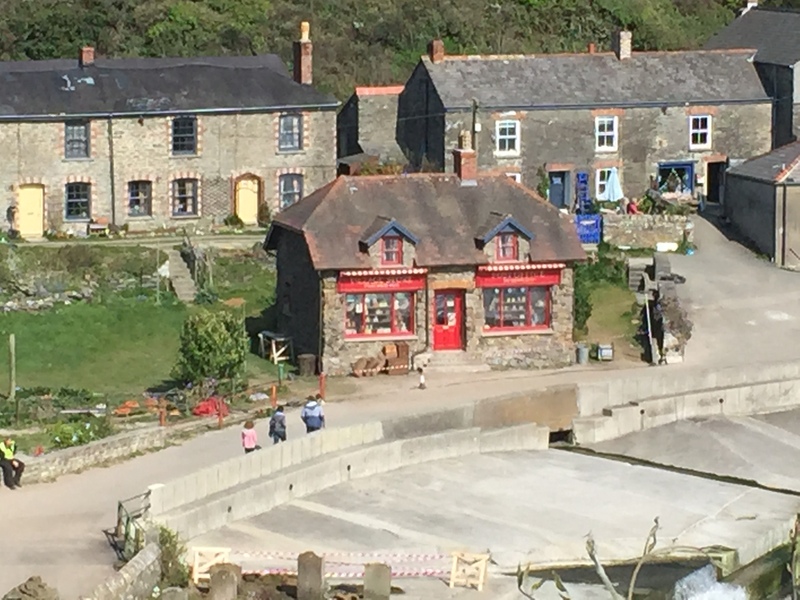 Doc Martin filmed at Port Isaac (Port Wenn), Port Isaac has been used for a number of other series as well as the original Poldark and the film Saving Grace that also started Martin Clunes. Poldark was being filmed again in 2016, in a number of stunning locations around Cornwall. You can visit the Botallack Mines in St Just and walk the headland above Chapel Porth, as well Charlestown, just up the road from us where they filmed some of the magnificent ships. Caerhays Estate also close by has been used in some of the scenes. Rosamunde Pilcher a renowned author who grew up and lived in Cornwall until she married, many of her books have been made into films and television series. They have been filmed in and around Cornwall for many years. Caerhays Estate and Trewithen both have been used as locations to film some of the books, as well as a number of stunning locations along the north cost of Cornwall. Miss Peregrine’s Home for Peculiar Children, in 2015 the Roseland was a buzz with the excitement of Tim Burton’s adaptation of Ramson Riggs’s book. Caerhays was transformed into a film set for three months, with most of the filming taking place in the little estate village of East Portholland, (pictured above/right) and on the beach at nearby Porthluney Cove.